I have three cabinets over the bar in my kitchen. The middle cabinet stays pretty straight. 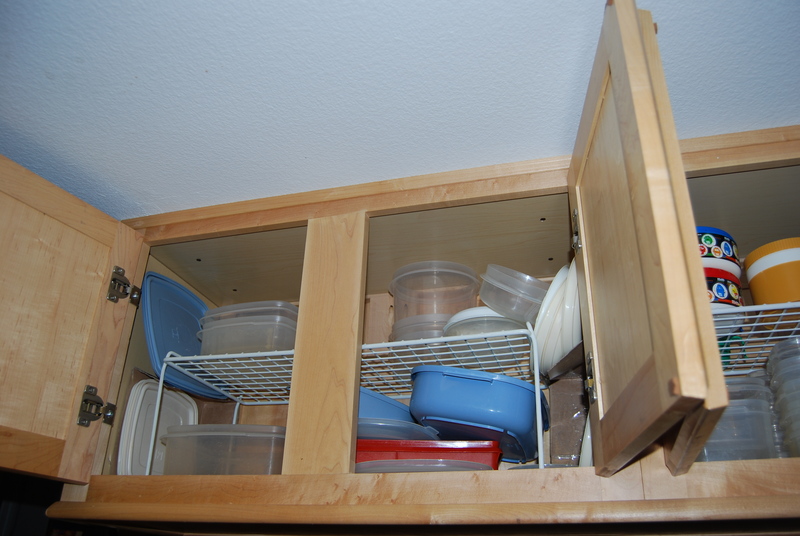 FavoriteSon unloads the dishwasher in this house, so if he’s putting items in this cabinet away in the same place every time, its organized in a way that he finds to be easy to maintain. Which means, according to the Underwear Principle, that the organization of the middle cabinet is working. So that’s the good. So what needed adjustment? Not really the left side. The left side stays pretty much like this all the time, just with more containers (we have a lot in the fridge right now). The square containers here are all the same – in only two sizes, which nest easily. But the right side is always a jumble. At first glance, I need to ditch some more round containers. (I HATE round containers, they waste space.) Also, the cardboard “shelves” I created to hold lids aren’t holding up anymore. So, I came up with two alternatives for the cabinet configuration. In both alternatives, I’m using an old rectangular container for round lids. (That container never sealed tightly and everything I ever tried to store in it went stale.) I’ll try out the one WITH the left sided shelf first and if the left side stays this way, I’ll leave it. If FavoriteSon says it’s easier to just stack all the containers on the left, instead of one size on the top shelf and another size on the bottom shelf, then I’ll ditch the left sided, top shelf. Either way, there’s enough room on the left side to store square lids. Now for the ugly. This cabinet rarely, if ever, looked the same when I opened the doors. NOT working. Too much stuff we never use. Two scales, Popsicle makers we never use, too many measuring cups, shakers we never use, salad dressing bottle I can never reach. Just a mess. All the time. This cabinet doesn’t need an adjustment, it needs an overhaul. Top row, left to right – My handy, dandy Chop Wizard, a new “lid” container replacing the ice bin, rarely used but sometimes needed measuring cups, shaker and salad dressing bottle (I can reach it here!). Bottom row, left to right – ONE scale with its bowl, often used measuring cups, white ice bin holding tiny containers (for dressings and such), two divided meal containers. Notice that one KEY component of this entire storage configuration is that I only have a few different TYPES of containers. 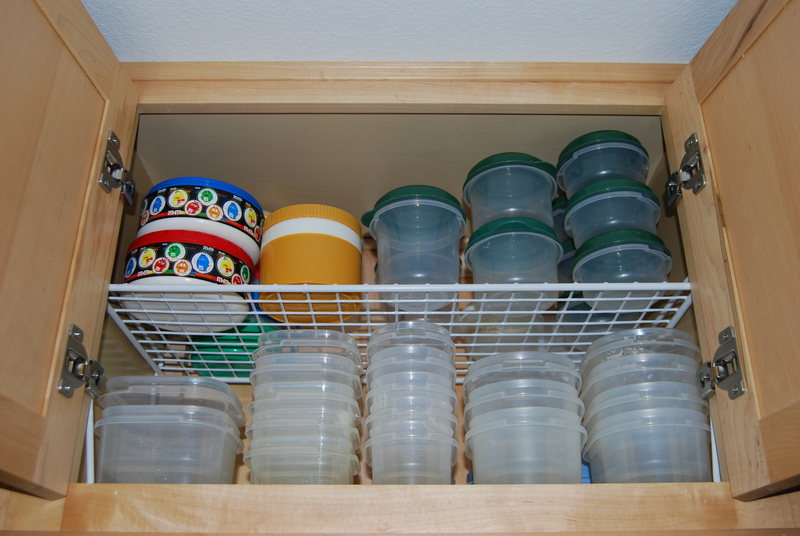 Over the years, I’ve purchased three of the same 40 piece Rubbermaid set and discarded the larger round containers. (We use the small round containers for lunch boxes, because I don’t care if they get lost along with the lunchbox flatware). So, when they are nested, all the containers in the stack are exactly the same. I don’t have to dig through an entire stack to find the size I need buried underneath smaller containers. And when we put one away, we don’t have to wade through the stack to find the perfect nesting spot. We just pop it on top or bottom of the stack. Done. Fast. Easy. 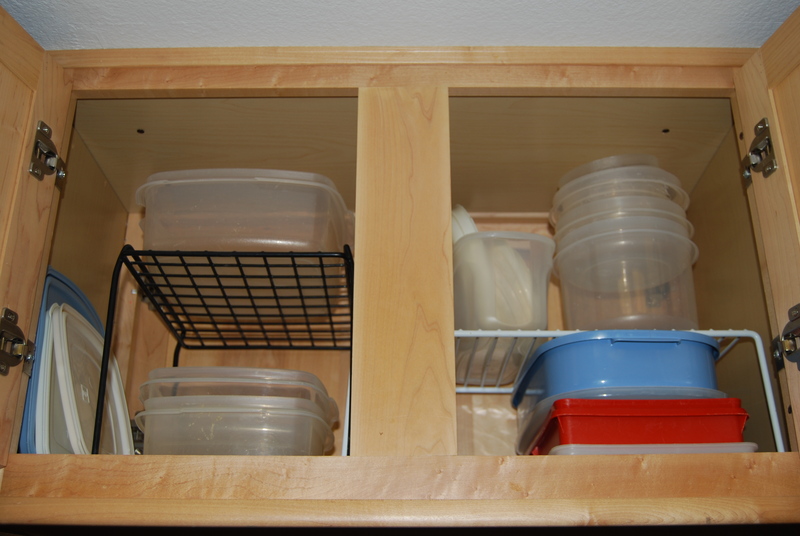 Rubbermaid doesn’t make this particular set anymore, and I don’t want add new types and sizes to our storage system. So, I just bought a “new in box” set on eBay a few months ago. I had to get rid of some because they were just shot (stains, cracks). Checking the dates of these photos, this cabinet overhaul was done on April 12, 2008. As of today, all three cabinets are still working. By “working,” I mean that when I open them, they still look like the “after” photos above. That’s not to say they will work in the future. Find lots of ideas and recipes at Kitchen Tip Tuesdays hosted by Tammy’s Recipes! And click on over to Works for Me Wednesdays by Shannon at Rocks in My Dryer for all kinds of tips and tricks! ← i hate this game. 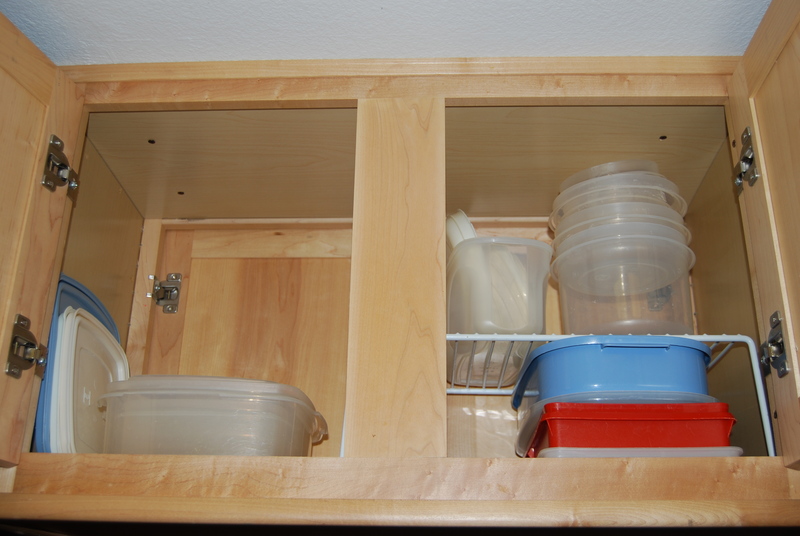 Oooh, I love organized cabinets…good job keeping them in “working” order! I love the “they are working now” part of that. Things change quickly sometimes and what was working just a month ago can be totally out of whack now. I notice with my kitchen that we have seasonal uses in the kitchen, too – so I move the salad bowls out from the bottom shelf and place them in the more visible spot in the summer time and place the deep fryer & crock pot where the salad bowls were residing during winter. OOOOH, lovely – I love seeing that beautifully organised AND functional cabinet. My plasticware cupboard is a disaster, but I have only myself to blame. It’s such a pain to pull everything out and re-nest and restack every time I empty the dishwasher. So what do I do? I just chuck it all in there. I would be so pleased if any of my cabinets were as organized as your “ugly” cabinet! gadgets similar to yours, in mine, too. Kinda freaky!! Love it! My plastics cabinet has gradually gotten out of control. I need to get it organized. Love the ice bin idea and the other container for lids. I’ve used the vertical lid storers with moderate success. Hi there! I found you through a link at someone else’s blog leading to your coffee video (which I loved, btw). With these plastic things I always find they are the worst to organize. I hate to throw out anything that turns out to be not recyclable so I usually end up using it in some new way. I have my dish sponges in the plastic bin my mushrooms came in, and I keep my cat-food can lids and smaller plastic container lids in those little baskets in which they package fresh berries. I could not hope to achieve the state of organization that you have here. I’ll keep trying though. I would be pleased if you would check out my poetry and story blog. I have linked to your site to keep up with your wonderful posts.